*5 Hours: HIV/AIDS and other communicable diseases. *5 Hours: Sanitation and Sterilization. *4 Hours: Disorders and Diseases of the scalp. 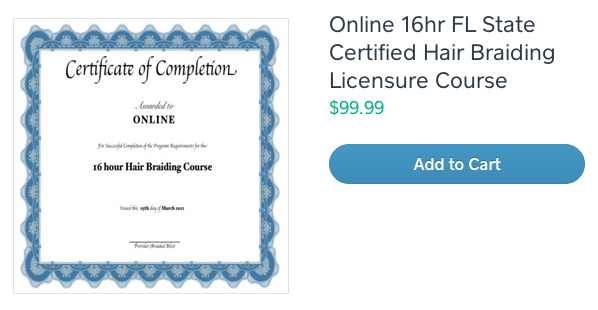 *2 Hours: Laws and rules of the State of Florida Department of Business and Professional Regulation, which affect the governing practices of hair braiding. Braided Bliss offers the Convenience of having access to the education you need, with the flexibility and price that fits your lifestyle. If you wish to pay by credit card over the phone, contact a representative at (813) 364-4247(HAIR) to provide your Credit Card Information.